Say a young person got into their car intending to drive 200 miles towards a city but then decided only 10 miles away from it that it was “just too far away” and turned around. What if they went for a drive, but shortly after leaving home, they stopped and sat at a stop sign for hours because they didn’t know where to go or who to ask for directions? What if they kept driving for days without ever actually going anywhere? What would we say about their behavior? We’d call them crazy. Or reckless. Or irresponsible. Why would you get most of the way towards a destination only to turn around right before the finish line? Why would you stay stalled at a stop sign, lost for hours instead of looking up directions? Why did you even go on this drive if you didn’t know where you were going or how to get there? But this is exactly what it is like for many people after completing their high school education. Before graduation their path was fairly straightforward - take the classes you need to graduate. After that when they try to achieve their goals, the path may have taken a more circuitous route, and even the destination may have changed or become unclear. They’re still driving, but they don’t know where they’re going. You can do it... but what is "it"? We tell young adults to work hard to achieve their goals but don’t always set them up to do so. We tell them to do something that will reward them in the long run, like obtaining their Bachelor’s Degree, but we neglect to mention that it may not be rewarding in the short term. In fact it may be extremely difficult in the short term, making it seem easier to give up because they cannot see the light at the end of the tunnel. When that happens, they’d essentially be giving up 10 miles from their destination because it took too long to get there. They began to believe that the path was excessively difficult. Perhaps they are no longer sure they even want to arrive. We give these young people the keys to their future and tell them to drive to where they want to go. But we can’t decide what their final destination should be, and we usually can’t/don’t give them step-by-step directions on how to get there. We tend to reward their movement because we see it as progress, but aimless progress is ultimately fruitless. Going to college just because someone told you to go will not be a sufficient incentive to finish. Their motivation has to come from within. Sure we have high school guidance counselors to help assist young people with their goals, and these people do an excellent job. They excel at trying to encourage students to make long term goals and to pick colleges, careers, and majors that align with their interests. True - in healthy relationships - friends, parents, and family members have always encouraged young people to move in a direction that they believe will give them long term success and happiness. But ultimately, the student is behind the wheel. They’re the ones who need to know where they want to go and how to get there. They will be the ones responsible for metaphorically putting gas in the car and steering it in the right direction. How does a person go about achieving their dreams and goals? Well, first off, they have to know what their dream/goal is. They have to be able to define it. Dreams give us direction. Sometimes, dreams are specific (“I want to become a Physical Therapist who owns her own private practice.”) Sometimes dreams and goals are more vague (“I want to have a job where I am my own boss and don’t have to answer to anybody” or “I want to have a job where I feel fulfilled.”) But what do these dreams and goals actually entail? What path does a person embark on in order to achieve them? A recent study from Erasmus University in the Netherlands indicated that focused, scalable, WRITTEN goal setting is not only a key component of achieving stated goals but also can serve to help close the gender and ethnic minority achievement gap. The act of goal writing can organize a person’s thoughts and feelings and assist them in creating a manageable plan for achieving those goals. To reach your dreams for the future, you have to generate specific, measurable, and attainable goals. As the study indicated, saying you want to accomplish a goal like “I’d like to have a more stable career” doesn’t really provide you with a specific outcome. How would you know for certain that you had achieved a vague goal like that? How would you know when you are engaging in a process that will lead you to this goal? How could you even know how to start on that path when you aren’t sure where the path goes or where it ends? 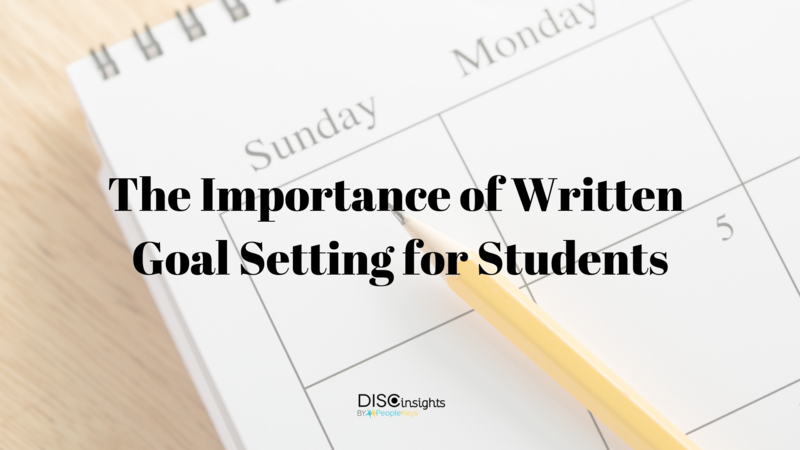 The benefits of engaging in a written goal setting activity allows the writer to engage in a systematic analysis of their goals. By creating a specific, measurable, written goal that increases incrementally, students in this study were able to engage in a process known as “self-authoring” - essentially taking control of the narrative of their lives. “Overall, the 'self-authoring' students greatly improved the number of credits earned and their likelihood of staying in school. And after two years, ethnic and gender-group differences in performance among the students had all but disappeared” (Kamenentz, 2015). This written goal setting process empowered the students to achieve their goals and to make it to their final destinations. That is why NPR recently called this process “The Writing Assignment That Changes Lives." 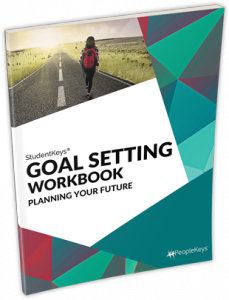 If you or someone in your life would like to become the GPS in their own life, check out StudentKeys’ Goal Setting Workbook for more information.